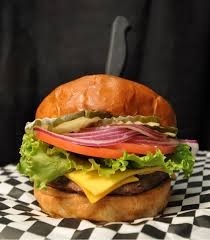 Tom's Burgers are served on bakery fresh buns and come with lettuce, tomatoes, Tom's special spread and fries. Sub tater tots (1.00), or salad (1.50). Pickles and red onions on request. A juicy beef patty with the trimmings. OUR SIGNATURE! This one is huge!!! Two juicy patties, fried egg, bacon, Swiss & American cheese. A juicy beef patty topped with cheese. A classic with bacon & cheese. A garden burger with Swiss & the trimmings. A bacon burger smothered with blue cheese crumbles. A savory hickory barbecue sauce on our delicious Bacon Cheeseburger.